What would do you wish would happen by the end of the day? 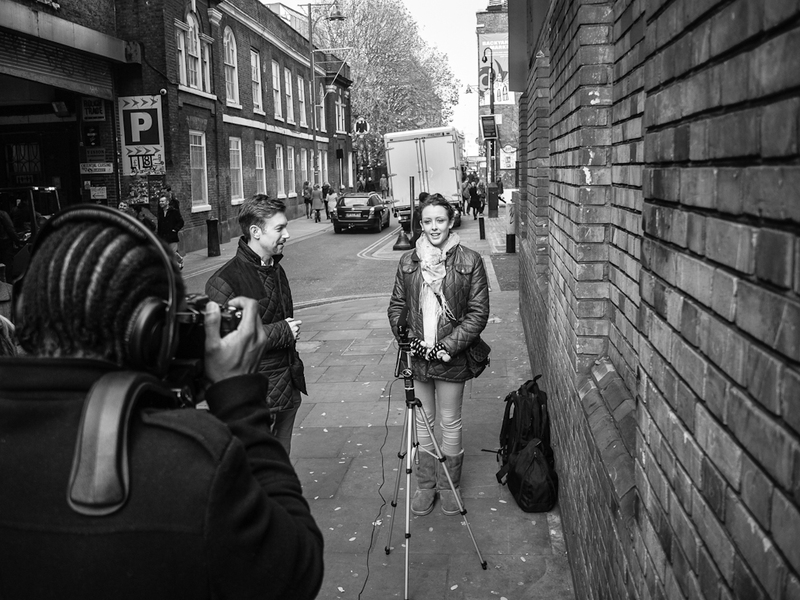 We used a Panasonic GH2, a Panasonic GF2and a Zoom recorder with a Rove directional mic. The audio is incredibly important because you want to capture people’s tone and emotion. I did the basic edits in iMovie synced the external audio by hand in iMovie. Next time I’d use Final Cut Pro because it can do the audio automatically. Getting strangers to stop and talk on camera requires a good dose of enthusiasm and diplomacy. A good camera and lens with a shallow depth of field does make a difference because you want to draw attention to the subject and blur out the background. But you could make a good video even on an iPhone (if you got the lighting right). We filmed using a shoulder brace but next time we’d probably use a tripod to keep the camera steady. You can see lots of other examples of the fifty people one question videos on this YouTube playlist. 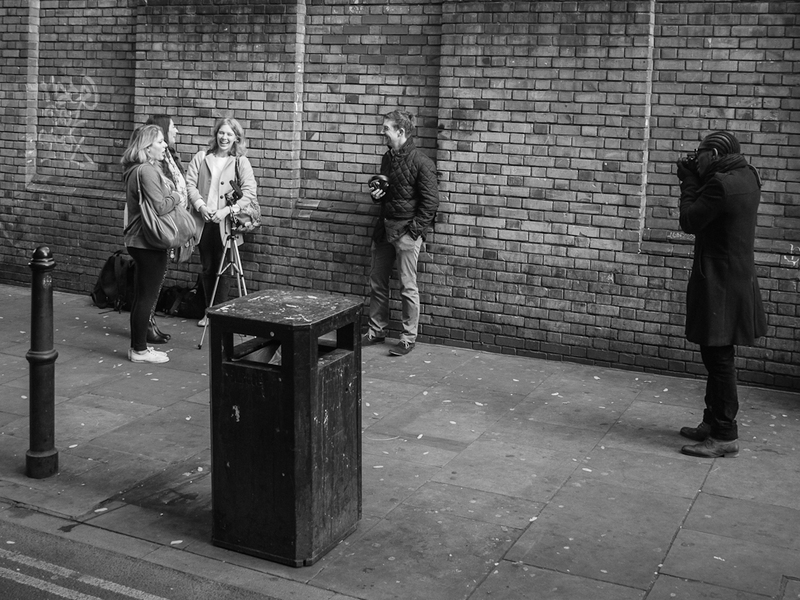 People in the UK are a bit reluctant to stop for strangers and hate being on camera. But you can overcome this with a bit of enthusiasm. The key is to make it seem safe and fun. By coincidence, several of our crew had done a personal development course called the Landmark Forum. This teaches a few techniques about personal interaction, like being polite and firm at the same time, and how to bounce back when people say no. 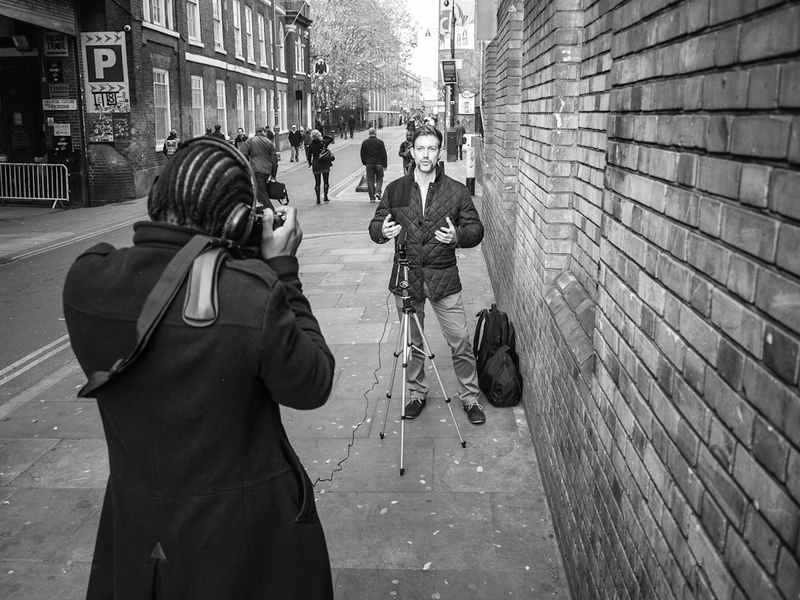 It doesn’t take a lot of gear to shoot street video, but good audio is important. We got a yes from about one in five people, so it’s important to be fearless and ask lots of people. The tones to avoid are “charity mugger”, “I’m selling something” or “needy”. Instead you create a mood that your crew is having fun, and you want the subject to simply be part of the fun. The aim is for them to enjoy their time on camera and come away with a good anecdote to share with their friends. We always made sure to tell them where the video was going to be used and how to find us. We also mentioned that the project was going on around the world and that it’s not a commercial thing, just a fun idea for people to see a slice of life from different people. These jobs can be shared and swapped so a crew of three is plenty on the day. We swapped around roles and it makes it more fun. The job of greeting people is lots of fun and directing people from off camera is very important because the camera person needs to pay attention to focusing the camera. We really enjoyed the afternoon and we’ll be releasing the full video soon. This entry was posted in London and tagged 50 Faces, 50 People by Peter Thomson. Bookmark the permalink.